London Eye. 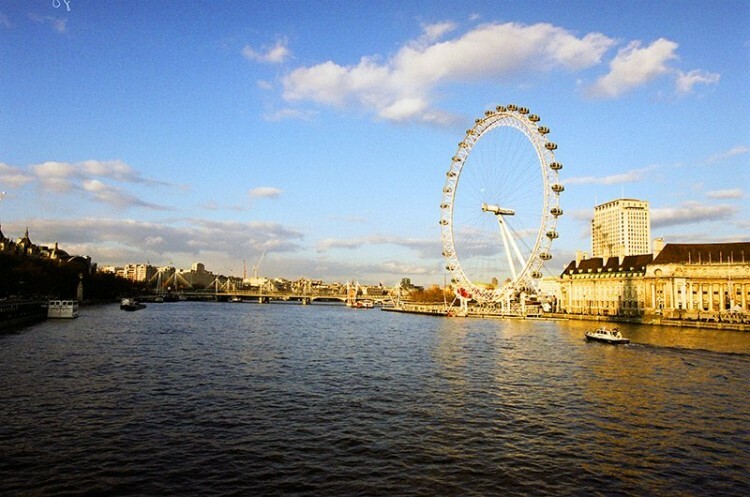 The London Eye is a giant Ferris wheel on the South Bank of the River Thames in London. As of January 2015, it has been advertised as the Coca-Cola London Eye. The structure is 443 feet (135 m) tall and the wheel has a diameter of 394 feet (120 m). When it opened to the public in 2000 it was the world's tallest Ferris wheel. Its height was surpassed by the 520 feet (158 m) tall Star of Nanchang in 2006, the 541 feet (165 m) tall Singapore Flyer in 2008, and the 550 feet (168 m) High Roller (Las Vegas) in 2014. Supported by an A-frame on one side only, unlike the taller Nanchang and Singapore wheels, the Eye is described by its operators as "the world's tallest cantilevered observation wheel".